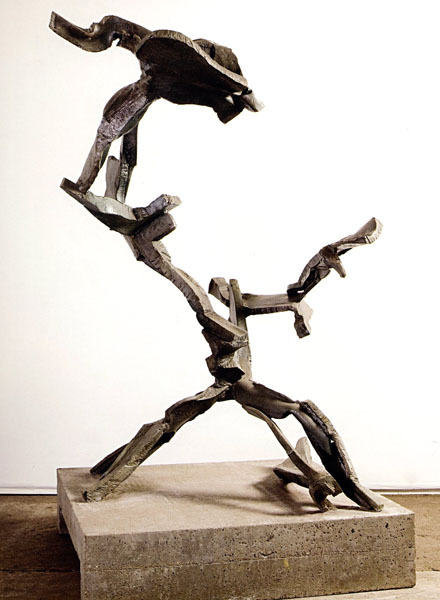 ... is a British sculptor of international standing, working principally in steel. This is her official website and presents an overview of her career since the late 1960s (see the Artist page), along with a searchable directory of her work (on the Sculpture page). We do not routinely store information about our visitors nor subject them to scrutiny and traffic analysis beyond counting visitors and observing overall usage patterns. Your IP address may be used to guess at your country and city (but nothing more precise). However, if the site offers shopping or other services involving users' choosing to supply personal information, the IP address may be recorded in the Semperaliquid database along with other submitted details (name, address etc) for security purposes, but treated of course with all due respect and confidentiality. Any and all such information will be used solely for the purpose for which it was supplied, and will certainly not be shared with any third party except at the insistence of a legally-enforceable court order or similar instrument. Cookies are pieces of information that may be generated and stored as small text files on your computer or other equipment by websites that you visit. They serve a variety of purposes, generally benign – online banking and shopping sites depend on them for security, for example, as well as for remembering the contents of shopping baskets (so-called 'session' cookies). Sometimes websites use them to help analyse visitor activity, or for advertising purposes (which is usually what is meant by 'third-party' cookies). Where we use them, it will be only as session cookies if the site's particular function requires that, and as a preferences tool, like any other program on your computer, to record your choices (on your own hard drive) when you change certain defaults. You can block or manage cookies via your browser's preferences/options panel; if you do so, it will scarcely affect your use of the site at all. Please note that a cookie 'belongs' not only to the website but also to the browser that generates it. If (as we hope) you come back again, but using a different browser, it will not have access to cookies (if any) created by the one you are using now. « The body has to work its way into space and sustain itself there. I want my sculpture to do the same.